e.l.f. is pretty much the Mecca of all baby makeup lovers on their merry little way to becoming hoarders beauty connoisseurs. It’s not a surprise either since their products are generally decent and the price point is something that everyone can agree with. I haven’t explored many e.l.f. products, aside from the eyeshadows when I was starting out, and of course, their brushes. Many people have graduated from e.l.f. color makeup to using higher-end alternatives, but a lot of pros and full-fledged beauty nuts still use their brushes. I’m particular about my brushes, to an extent, but I’m not above looking for cheaper alternatives to MAC or Hakuhodo. A while back, I purchased a relatively cheap set of brushes and while most of them were pretty good quality, I wasn’t really happy with the stippling brush it came with, so the search went on and on. I wasn’t really into the thought of splurging for a stippling brush because I would honestly just buy more for eyeshadow, so I looked into the e.l.f. one from their Studio Line (which is their “higher end” line, with the black handle and bristles). These are the bristles. 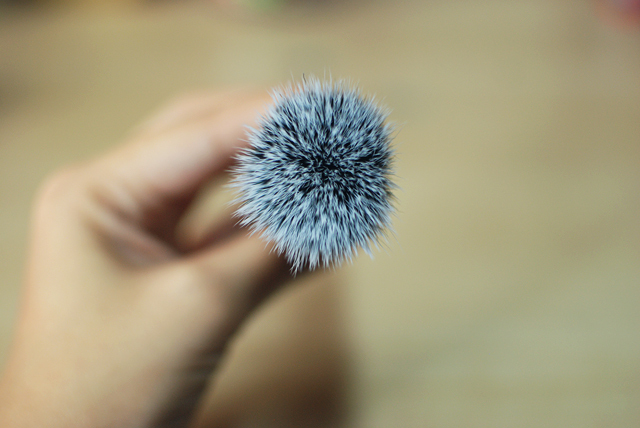 I am really not a brush expert, so I’ll just show you mine and let you be the judge. The first one I got (not e.l.f.) 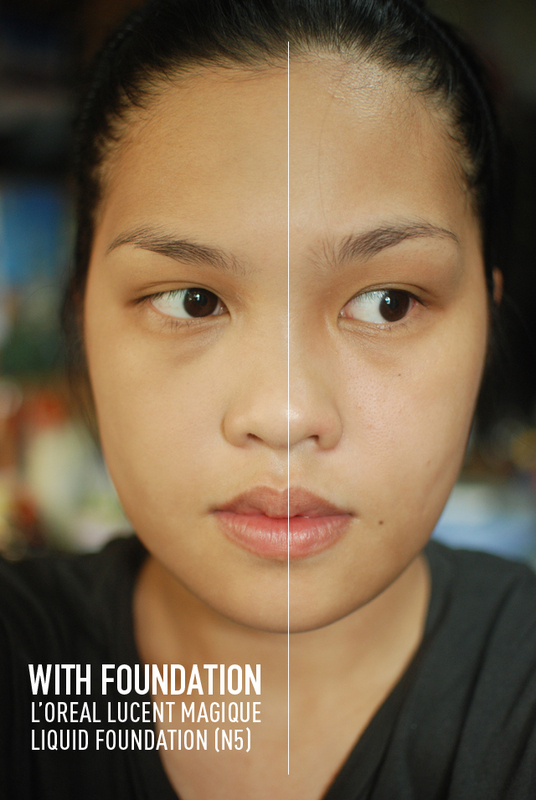 was flimsy and it annoyed me when it flopped around whenever I tried to apply liquid foundation. This e.l.f. one flops around, too, but not nearly as much, and the application is much nicer. This is a blob of foundation I used to cover half of my face. 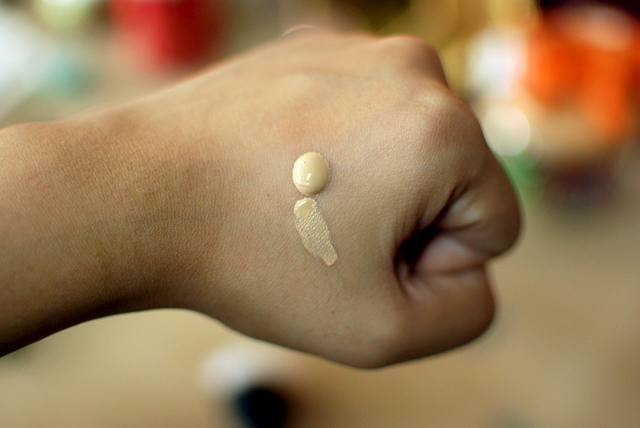 I just used half a pump of L’Oreal’s Lucent Magique Liquid Foundation (N5) and went to work. If you can see, the foundation-less half of my face has visible pores, whereas the half with foundation has some kind of optical blurring action going on. There are also no visible streaks, so that’s always a good thing because those are embarrassing. There was a negligible amount of shedding, but I wouldn’t worry too much about that. Anyway, I hope this was helpful for you! This is $3 in the USA and Php 249.75 in local department stores, if I’m not mistaken. Quite a high markup, in terms of percentage, but I think it’s still cheap for a good quality brush. I LOVE RealTechniques, though! 🙂 I would have gotten that if I wasn’t on a budget for this brush. I have this brush and I love it!!! It’s soooo good for that “no pores” look. Agree on the shedding part but hey for P250, not bad at all! I love the elf studio brushes. All of them. As far as Real Techniques… so far I’ve only bought the blush brush because Ulta is always sold out of most of the Real Techniques brushes every time I look in tbe store. I have this one and the flat top brush. I use the stippling brush for very pigmented blushes. I find that it has too much yield to be used for foundation. 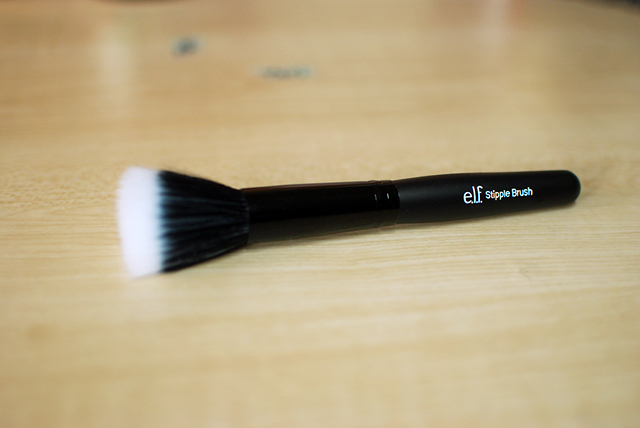 ELF seems to be inconsistent with the quality of their brushes… It’s unfortunate that yours shed. My stippling brush didn’t BUT the flat top one shed a lot… as in, a LOT. Is the flat top brush the powder brush? Haha sorry I’m a dunce. I like this for blending. I pump the foundation on my hand and dot it on my face with my fingers then blend out with this. It wasn’t like a disgusting amount of shedding, but I noticed some of the hair fall off. Sadly, I have to agree with you on QC. I got a primer once and it was so dried up, not usable at all! Yup, that one. The shedding is too much. Maybe that’s what we pay for cheap — inconsistency. Weird, mine doesn’t shed at all! Haha I guess it’s a hit or miss for e.l.f. I wish we had a return policy here though, lol. well I am jealous your foundation side and non-foundation side both look amazing. Your skin looks poreless says the lady with the crater pores! I have never actually tried anything from elf because I can only get them online here, I haven’t seen them being sold in stores.. Helpful post though, as I’m always looking for better brushes I can use. Hi Yvane, it’s hard to shop for makeup that way, but I guess tools could be OK? If you decide to get them, I hope they perform to your standards 🙂 Don’t you have RealTechniques there? Those are super good value, too!